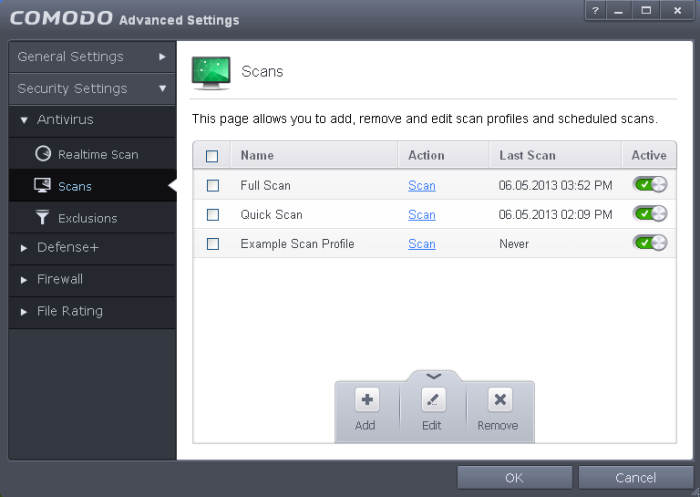 By creating a custom scan profile, you can choose exactly which files and folders are scanned, when they are scanned and how they are scanned. 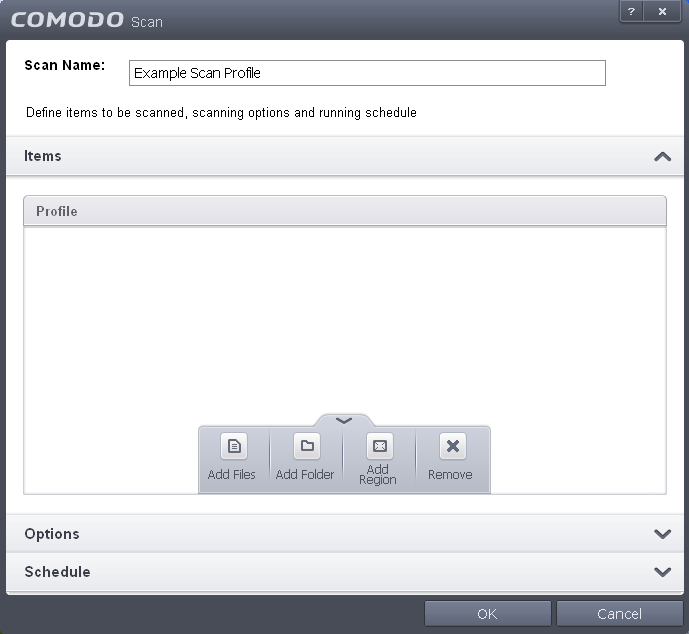 Once created and saved, your custom scan profile will appear in the scans interface and can be run, on demand, at any time. Enable scanning optimizations – On selecting this option, the antivirus will employ various optimization techniques like running the scan in the background in order to speed-up the scanning process (Default = Enabled) . Decompress and scan compressed files - When this check box is selected, the Antivirus scans archive files such as .ZIP and .RAR files. Supported formats include RAR, WinRAR, ZIP, WinZIP ARJ, WinARJ and CAB archives (Default = Enabled) . 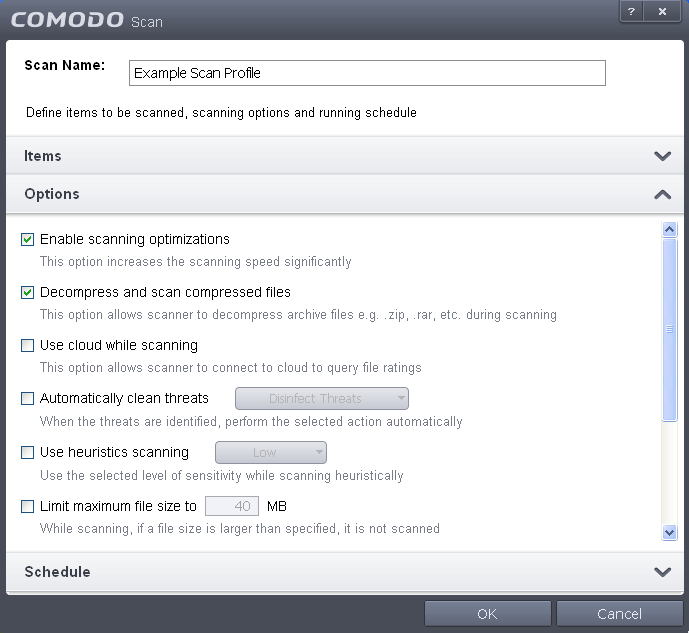 Run this scan with – Enables you to set the priority of the scan profile. You can select the priority from the drop-down. (Default = Disabled). 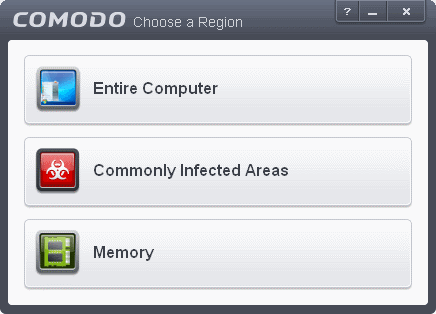 Update virus database before running - Instructs Comodo Internet Security to check for latest virus signature database updates from Comodo website and download the updates automatically before starting the scanning (Default = Enabled). 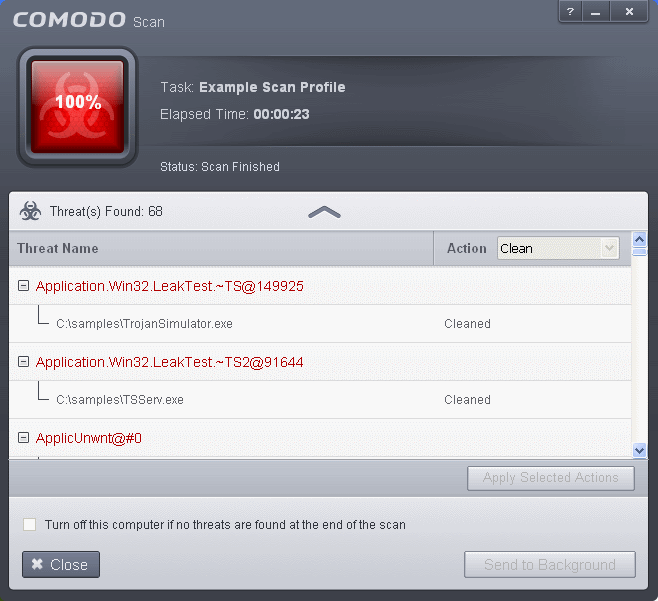 Detect potentially unwanted applications - When this check box is selected, Antivirus scans also scans for applications that (i) a user may or may not be aware is installed on their computer and (ii) may functionality and objectives that are not clear to the user. Example PUA's include adware and browser toolbars. PUA's are often installed as an additional extra when the user is installing an unrelated piece of software. Unlike malware, many PUA's are 'legitimate' pieces of software with their own EULA agreements. However, the 'true' functionality of the software might not have been made clear to the end-user at the time of installation. For example, a browser toolbar may also contain code that tracks a user's activity on the Internet (Default = Enabled). The profile will be available will be available for deployment in future. 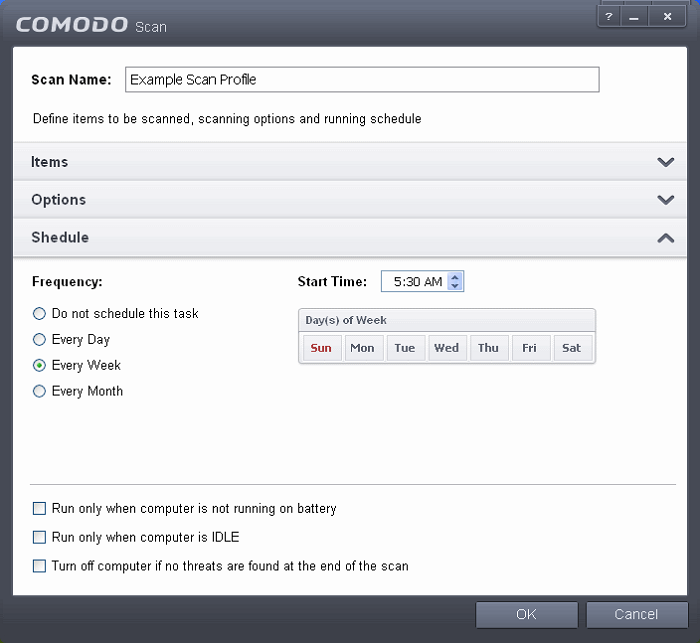 The 'Advanced Settings' interface will be displayed with 'Scans' panel opened. Click 'Scan' beside the required scan profile.